A man is not a plaster wall waiting to be patched. 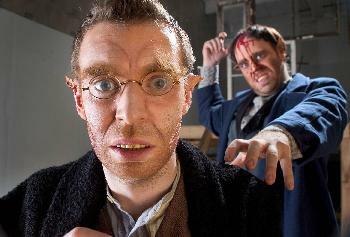 The Flying Machine returns to Soho Rep with its adaptation of another novel, Mary Shelley's classic horror tale. Two years ago, I reviewed and liked its adaptation of a less well-known work, Signals of Distress (review linked below). But do not make too much of your greater familiarity with Frankenstein: the story Joshua Carlebach and his colleagues fashion in this adaptation is only recognizable at the margins. The focus here is on the creator far more than the created -- in a sort of romantic morality/fairy tale that also manages to channel Dostoyevsky while suggesting Dickens. We first meet Victor Frankenstein as a young boy (Tami Stronach), when his mother (Carine Montbertrand) sets in motion the inquisitive mind that will concoct the monster that Boris Karloff made famous. After that introduction, we fast-forward to Victor at college (Robert Ross Parker), by which time he is experimenting on toads. Contrary to the admonitions of his professor (Jason Lindner), Victor subverts the natural order, reëngineering the animal so that its chances of survival are enhanced. The trouble comes to the forefront when, having accidentally caused the death of a neer-do-well, Gershon (Richard Crawford), he applies his toad techniques to return the man to life, with the well-known consequences. There is much to commend here, chief among the assets being a take that does not jettison the "horrors" but finds its own means of expressing them. Like Signals, it is a thoughtful piece that asks us to consider the issues and pathologies brought on by the story. At times it seems to reach for parallels it doesn't quite establish but on balance it feels like time well spent. The cast is quite excellent, both in substance and particularly in tone. Both Crawford's monster and Parker's maker are especially impressive for their curiosity and detail. The design team has provided a significant contribution to the overall effect as well. Marisa Frantz designed a set consisting largely of old windows and panels that revolve on dual axes and often themselves. It not only defines the period in which the production is set (abetted by James Weideman's lights and Theresa Squires' costumes) but also underscores the "puzzle box" theme which is at the heart of this adaptation. The music of Jacob Lawson and the overall sound design of Jeff Lorenz is both atmospheric and well-considered.